The original title card for the pilot. 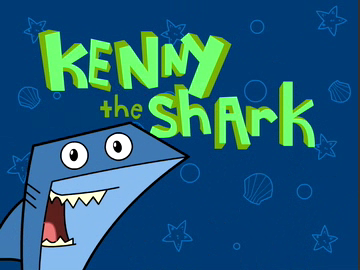 Kenny the Shark is an American animated television series that originally aired on Discovery Kids from 2003 to 2005. Two 11-minute pilot episodes for the series, along with a short animated music video, were originally produced in 2001 by New York City-based studio Bullseye Art (later known as Raw Power). 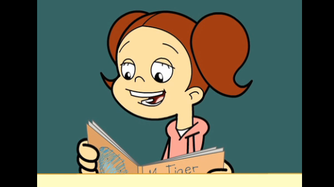 The pilots feature a portion of the main characters from the final product, including the titular tiger shark Kenny, his owner Kat, and Kat's parents. However, drastically different character designs, animation, and (presumably) voice actors are used. The first episode revolves around Kat and Kenny competing with another girl and her poodle at the local park to determine who is the better pet. A loosely similar storyline was used for the full series episode "Pet Tricks". 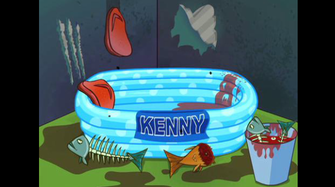 The storyline of the second episode is currently unknown, although judging by video descriptions from Hub Network's website, it appears to involve Kenny eating the family's pork roast dinner, as well as them going shopping at "Grocery Stadium" while Kenny's presence keeps the store on alert. 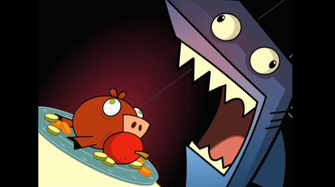 A short animated music video featuring the characters singing about the prehistoric megalodon shark was also produced, intended to be aired between both 11-minute segments. 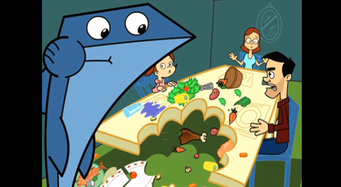 A rough version of the first episode that features no background music or sound effects, along with a low-quality version of the Megalodon music video, were available on animator Ryan Edwards' website, but the page has since been removed and redirected. They were reuploaded to YouTube on October 8, 2018, by user SpongeRobert RectangleShorts (known as Thespongeywun on LMW). 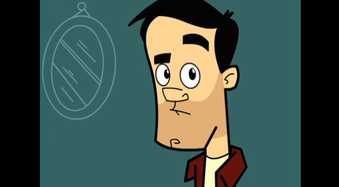 Currently, no known footage of the second episode is available online, although clips were supposedly available on the Hub Network's website as early as 2010. However, since Hub was rebranded as Discovery Family in 2014 (which included a new website), these videos are no longer available. Rough version of the first pilot (no music or sound effects). "Megaladon" [sic] music video (low-quality audio). Possible image from the second episode.